If you have been following the Gazette for any length of time, then you know I am a fan of the artwork of Christi Bunn. 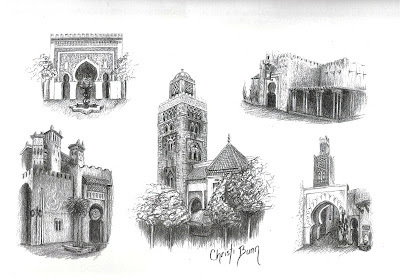 Her drawings cast the structures and pavilions in such a unique light, and in a medium not often used in Disney art pieces, that you are immediately drawn into them. While her subject matter is vast, both involving Disney and subjects beyond the Disney’s borders, she captures the essence of World Showcase’s pavilions unlike any other. I could spend a lot of time in World Showcase, especially in the corner that includes Japan, Morocco, and France. I don’t know if it is the food, the romantic atmosphere of these countries (after all, Japan and France were featured in the romantic scene of Delta’s Dreamflight), or the amazing style of gardens and architecture that draws me in, perhaps it is all of the above, but I could wander these three pavilions all day. Recently, Christi ran a contest on her site for one of her prints and I was lucky enough to win the Morocco print seen above. It is a fantastic addition to the many pieces of Disney art, pictures, paper, props, and souvenirs that adorn the walls in my office. In fact, even though nothing Disney is supposed to leave my office, my wife is considering hanging it in the living room. I really like this style of art, pencil or pen and ink. Thanks for pointing me to her website!